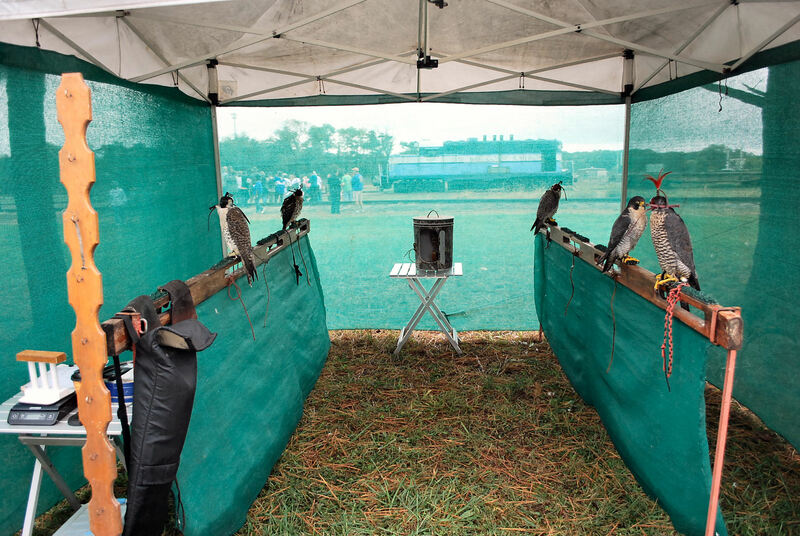 Every year during the first week of October, thousands of bird lovers gather on the Eastern Shore of Virginia for the annual Birding Festival. 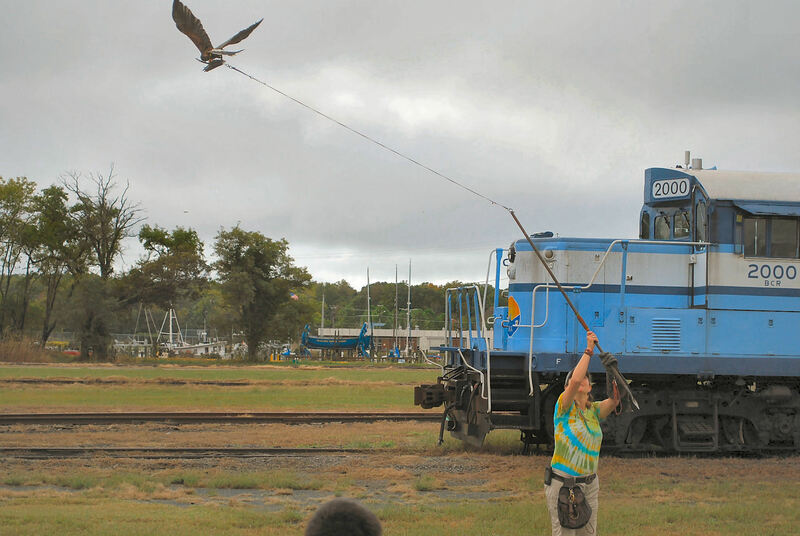 Hosted by the Eastern Shore of Virginia Festivals, Inc, a local non-profit, we recently celebrated the 21st annual Birding and Wildlife Festival. 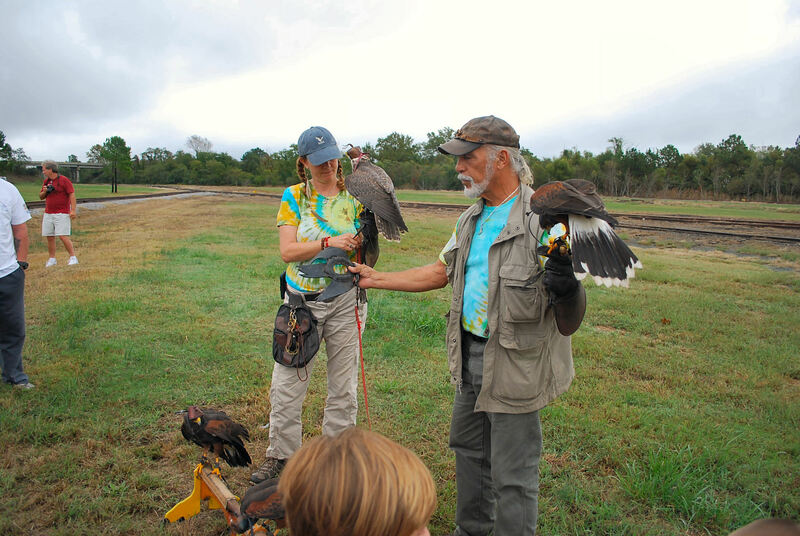 Coinciding each year with the annual fall bird migrations, the Festival is a celebration of the amazing variety and quantity of bird life found here on Virginia’s Eastern Shore, especially at the Shore’s beautiful Southern Tip. 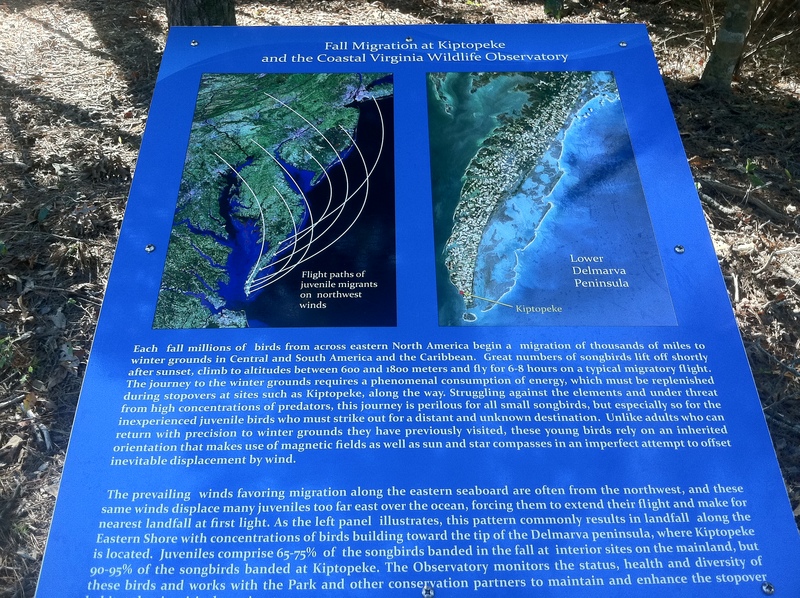 Since the land mass of the DelMarVa (Delaware, Maryland, Virginia) peninsula, of which the Virginia portion is the southern terminus, is widest at the northern section and narrows gradually as one moves south, it acts almost like a funnel. The bountiful tip of Virginia’s Eastern Shore, just south of Cape Charles, VA where the land ends as the Atlantic Ocean and the Chesapeake Bay converge, is a bird-friendly area offering lots of food, water and protective vegetation becomes the natural “layover” point for millions of migrating feathered friends as they travel south along the Atlantic Flyway. So what better location to hold a Festival to see and learn about a whole variety of birds than the special place where they stop to rest and feed before beginning a journey over open waters ? Having spent a summer nesting and parenting, munching on gourmet goodies like seeds,worms and insects, just generally loafing around and yuking it up in the temperate climate of the East Coast of North America, the Birding Festival takes place during the peak migration period. Migration is dangerous, a journey from which is estimated that nearly half will not survive to return to breed in the Spring because of the predators encountered en route and the hazards of a long, energy-demanding flight over lengthy stretches of open waters. Since the Chesapeake Bay is a large physical barrier, it is especially important that natural habitat offering plentiful food and cover be available at the tip of the Shore to provide for refueling and protection from predators as the birds rest for a day or two before departing on the next leg of their journey. This makes it especially important on the Eastern Shore for individual landowners and conservation groups to make sure that the trees, shrubs and grasses which provide the critical seeds and berries needed by the birds are maintained . Towards this end, several large farm parcels located in this very critical rest corridor have been purchased by The Nature Conservancy for the express purpose of trying to maintain vegetative cover for bird habitat. 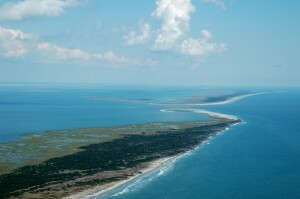 And The Nature Conservancy has also been very active in preserving other critical bird life areas on the Eastern Shore including acquisition of the famed “Virginia Coast Reserve“, the off-shore Virginia Barrier Islands chain, now designated as a United Nations Biosphere, purchased by the Conservancy to protect them from development and to maintain crucial wildlife habitat. 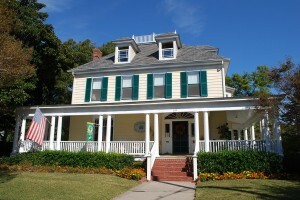 The Festival includes a central Exhibitor’s Hall in Cape Charles, a forum for conservation groups and private firms to provide information on their programs. Once again the exhibits by the Virginia Living Museum were a big hit, especially the de-perfumed skunk which the kids had great fun petting. 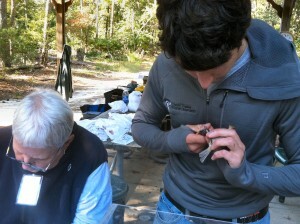 But some of the really fun stuff involved a few special programs and the amazing variety of unique field trips. 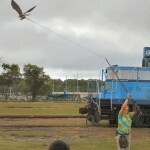 Which brings us to the beautiful Harris Hawk named Fire. She is the big star of an amazing show featuring various raptors in flight, called, duh, the Flight of the Raptor. 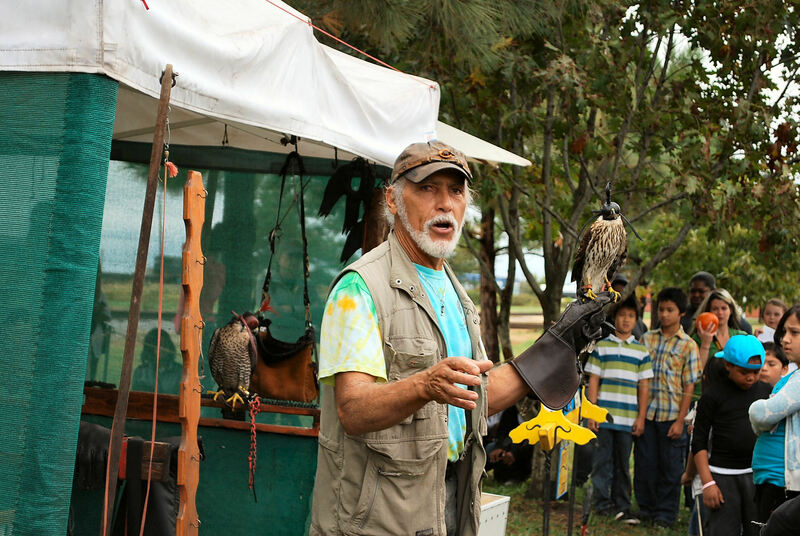 Started in 1995 by Master Falconer Ray Pena, this fascinating demonstration includes numerous hawks and peregrine falcons who have been trained to catch a lure in mid-air and bring it to ground, just as they would in the wild. Apparently for nearly four thousand years raptors have been trained by man to help hunt for food, especially rabbit and pheasant. 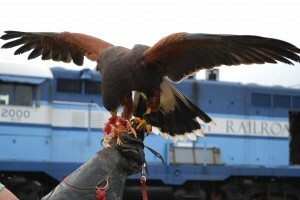 During the show, Fire and other hawks are released and freely fly to any nearby perch— in Fire’s case, to the top of a Bay Coast Railroad locomotive. 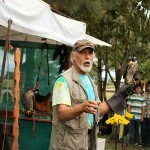 The falconer then twirls a feathered or fur lure in circles over his head, the hawk circles overhead and then dives for the lure, bringing it dramatically to ground. 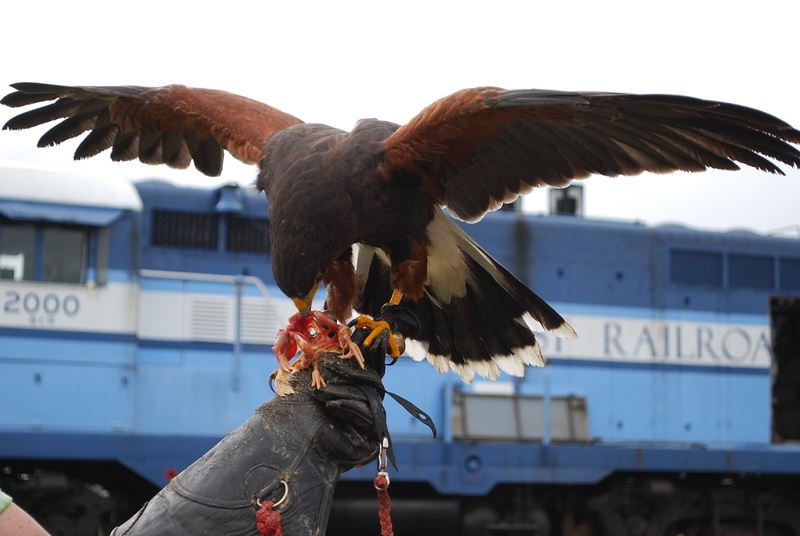 Ray gets the hawk to release the prey to him and rewards it with a bit of raw chicken, Fire’s favorite treat. ( By the way, hawks eat everything from their catches — feathers, fur, bones, the whole nine yards, which help satisfy the mineral requirements in their diets. ) The substantial crowd which had gathered for this demonstration was pretty amazed to see how, when these hawks are released from their perches, they fly off to a nearby tree or whatever, watch for the lure, dive for it and then let the falconer take it away from them. 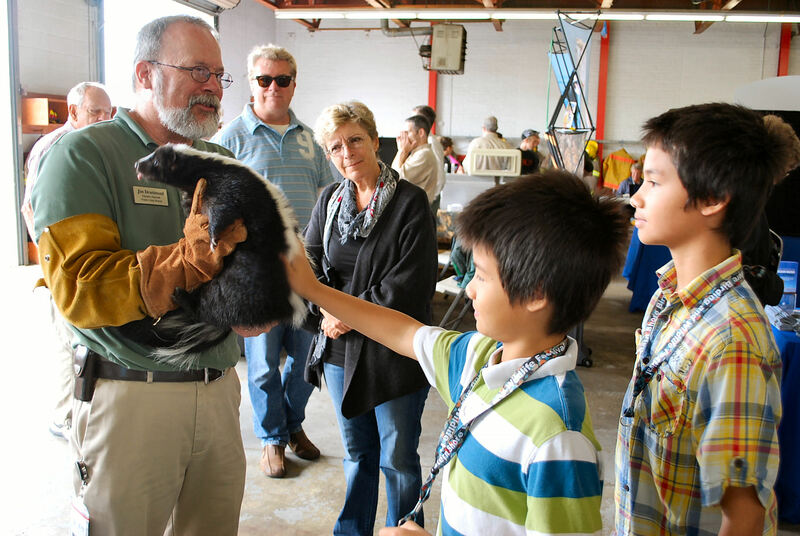 All kinds of interesting field trips are available for attendee participation — ranging from bird banding demos, hikes, boat tours and workshops, there is something for everybody. The bird banding is fascinating and the hikes are a big favorite, especially the Eyre Hall Hike over 600 acres of diverse habitat along Cherrystone Creek. 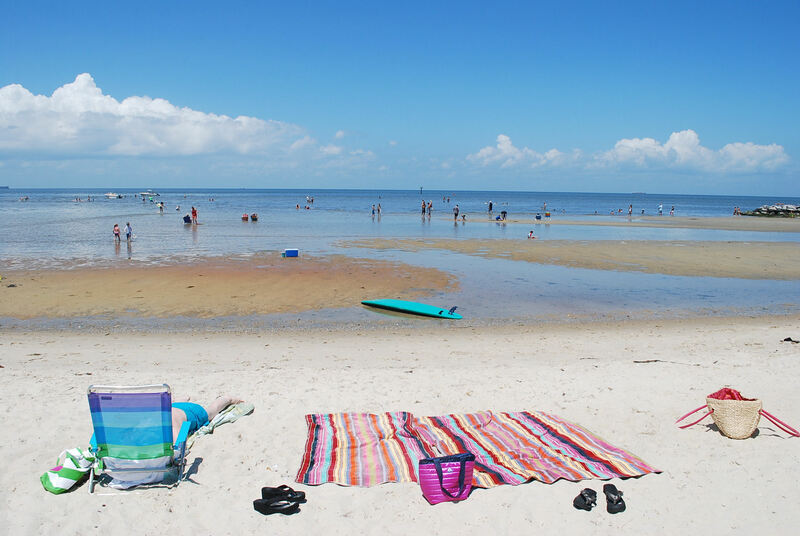 Here hikers will see mature forests, freshwater marshes and ponds, open saltwater beaches and tidal flats as well as open farm fields. Bird watchers are invited by the owner to tour the famous gardens associated with Eyre Hall’s circa 1760 home. The Owl Prowl Sounds of the Night outings at the Virginia National Wildlife Refuge and the Kiptopeake State Park are also lots of fun and good opportunities to experience nocturnal wildlife activity. 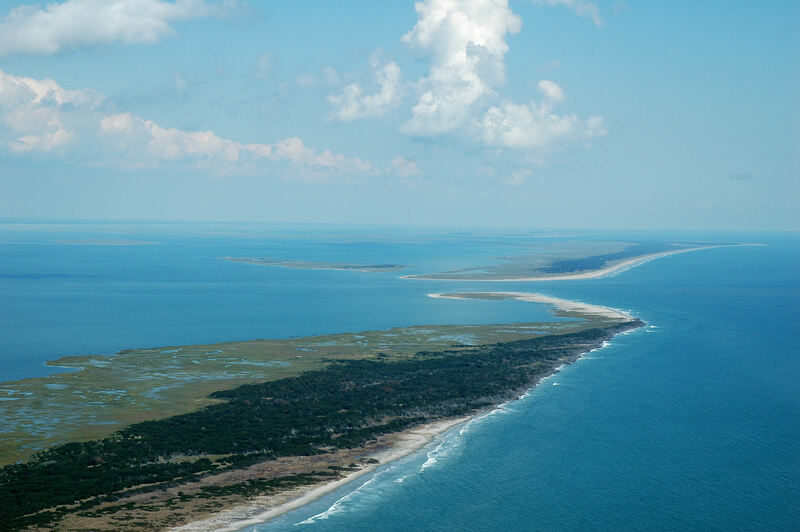 Captain Buddy Vaughan’s Cobb Bay Boat Excursion leaving out of Oyster village harbor is an exciting way to see a barrier island beach and view numerous shorebirds including oystercatchers, whimbrels, sandpipers and terns. For attendees hoping to see clapper rails saltmarsh sparrows and maybe even a Delmarva fox squirrel, Capt. 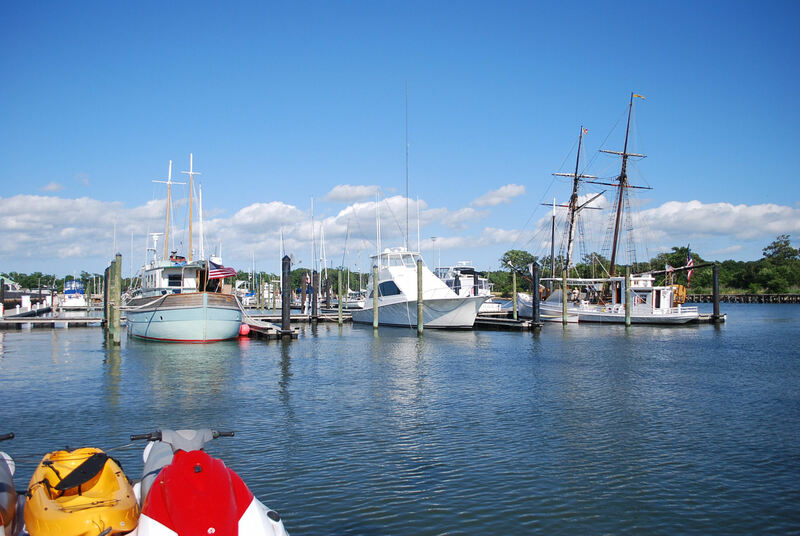 Rick Kellam’s Broadwater Bay Ecotours out of Willis Wharf offered a boat tour of the pristine Machipongo River, a seaside saltwater inlet from the Atlantic Ocean. 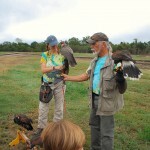 Popular workshops included the Butterfly Walk and the Dragonfly Workshop & Field Trip. Another interesting boat trip, sponsored by the Virginia Dept. of Environmental Quality, was the Sea Grasses and Oyster Reefs Boat Trip. 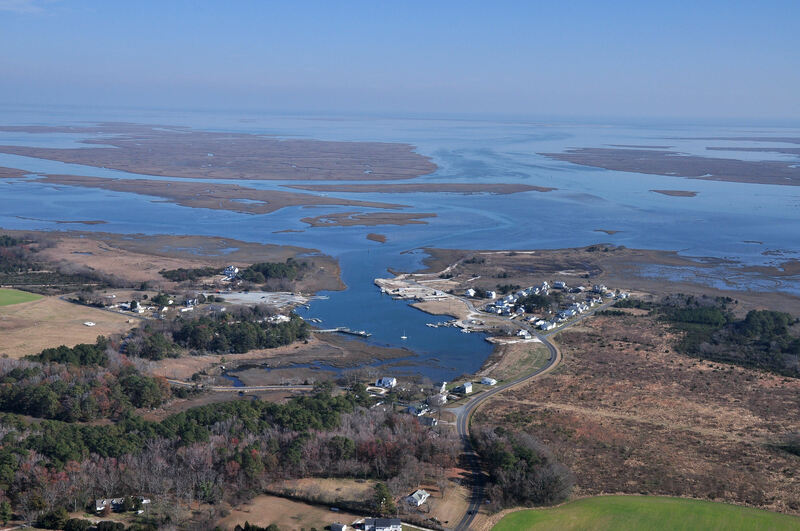 Also departing out of Oyster village, this trip traveled to the nearby sites of the US’s largest and most comprehensive aquatic grass restoration project, a $6,000,000 investment by Virginia Coastal Zone Management to support shellfish farming and ecotourism. 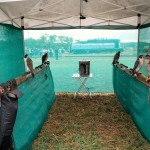 Something for everyone is the promise of each Birding Festival and it truly delivers on that promise. 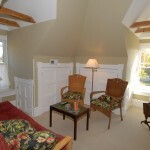 What better opportunity to marry a love of fine historic homes with a spirit of entrepreneurialism than operating a B&B ? 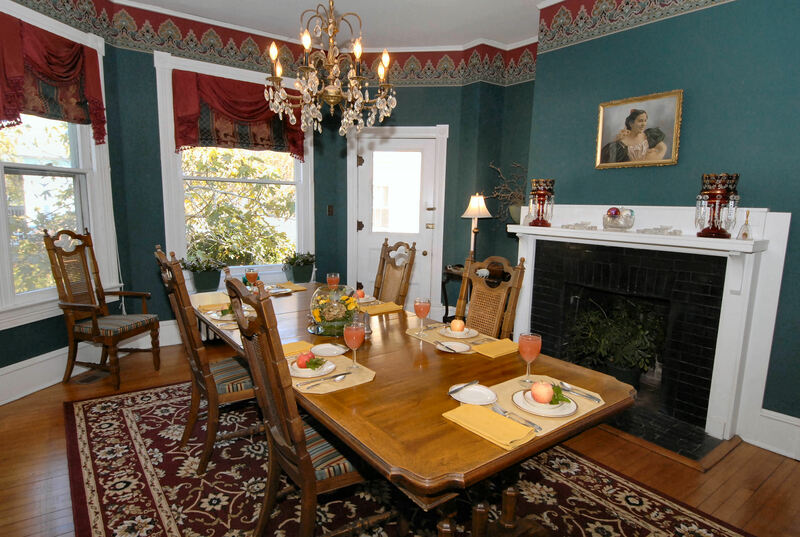 And what better place to purchase a gracious Bed and Breakfast featuring fine Southern hospitality than in Cape Charles, VA which offers an exciting coastal lifestyle in an intimate small historic town environment ? 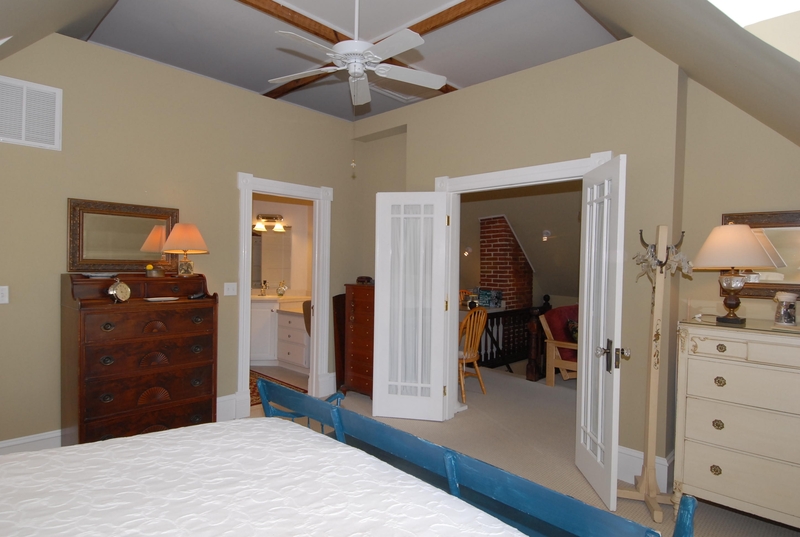 Presto, Blue Heron Realty Co. has just listed a fine opportunity to follow your dream of both owning a gorgeous historic home and running your own business with this charming 7 bedroom, 8 bath beauty. Located on the beautiful Southern Tip of the Eastern Shore of Virginia, which is the slender terminus of the DELMARVA peninsula, bordered on the West by the Chesapeake Bay and on the East by the Atlantic Ocean, Virginia’s Eastern Shore is a dream location for anyone interested in coastal traditions. 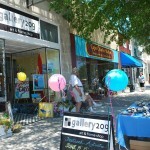 And the charming Victorian town of Cape Charles is the epicenter of cultural and maritime events on the Shore, so it’s a terrific place to live a water-oriented lifestyle as well as to operate a business that takes advantage of these special assets. 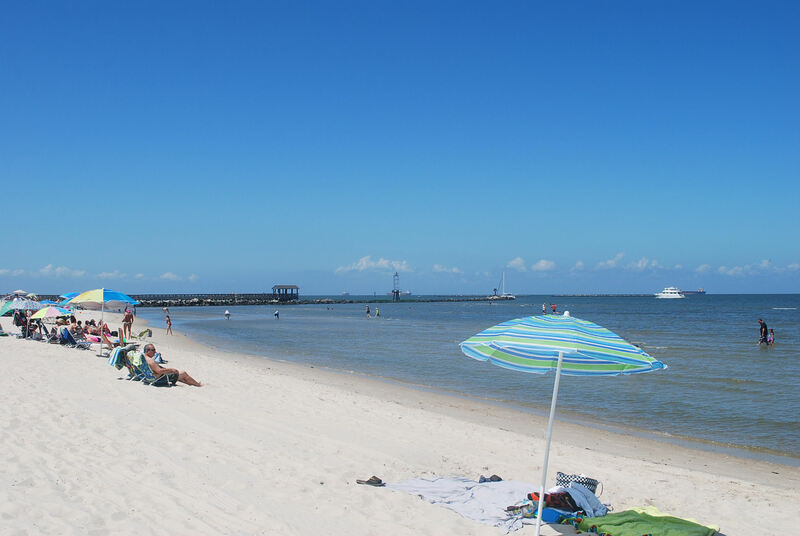 In fact, in 2012, Cape Charles was named by Southern Living magazine as one of its ” 5 Best Little Beach Towns.” And we’re also proud to announce that Cape Charles and Blue Heron Realty Co. were recently chosen by the Home and Garden TV Network (HGTV) to be a featured episode, airing in January, 2014, of its exciting new series entitled “Beach House Bargain Hunt”. 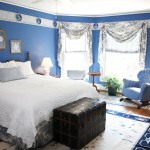 Introducing the Cape Charles House Bed and Breakfast, one of the town’s largest and most opulent homes. 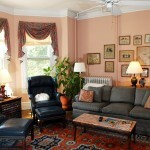 Constructed in 1912 on the highest point of land in Cape Charles, this 5900 sq. 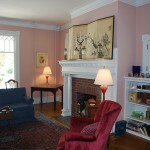 ft. classic Colonial Revival was lovingly restored by the current owners. 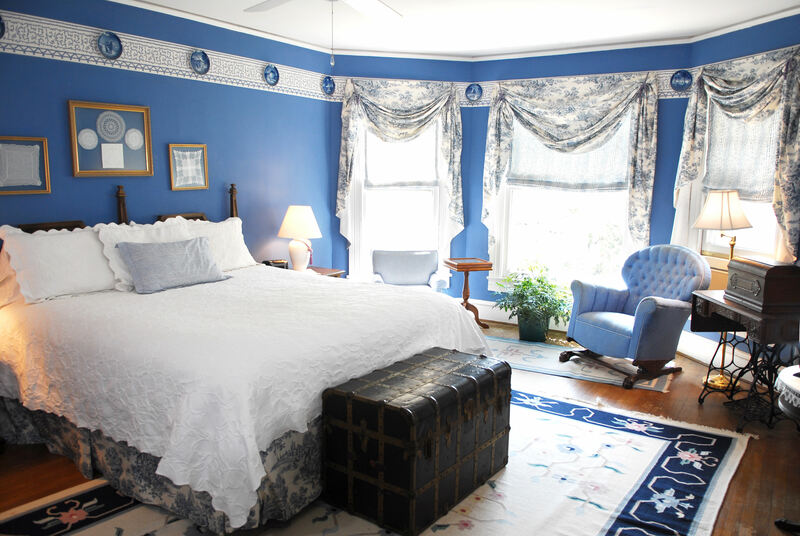 Featured on the well-known HGTV program, “If Walls Could Talk” and a recipient of the coveted Governor’s Award for B & B Hospitality, this long-established B & B has been welcoming guests since 1993. 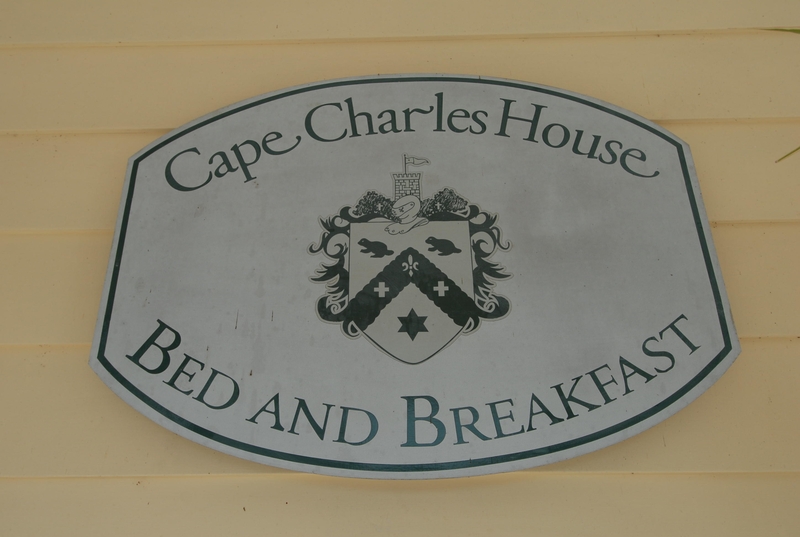 With 5 spacious guest rooms, each with a sitting area, an en suite bath and individual climate control, Cape Charles House offers guests a great place to just unwind and relax. 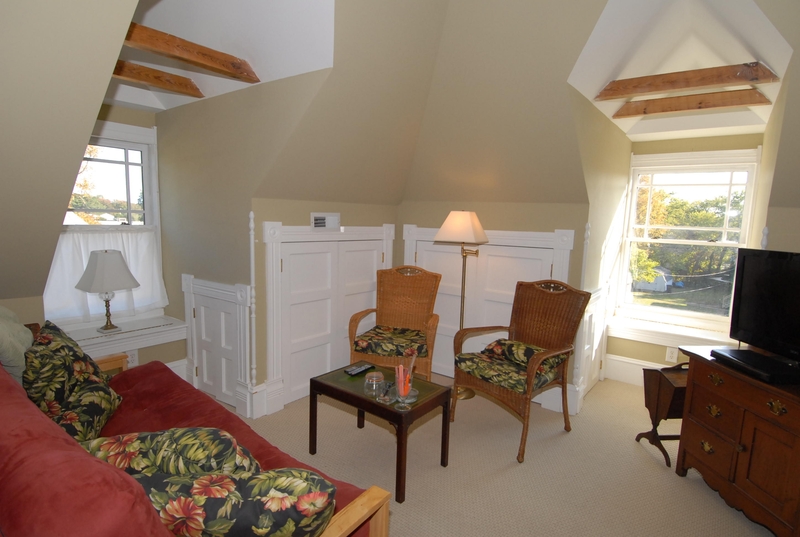 Numerous large, sunny windows in guest rooms and in the spacious common areas create a pleasant, light and airy feel throughout. 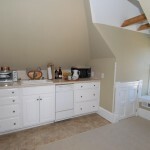 The gorgeous original hardwood floors were hand restored. 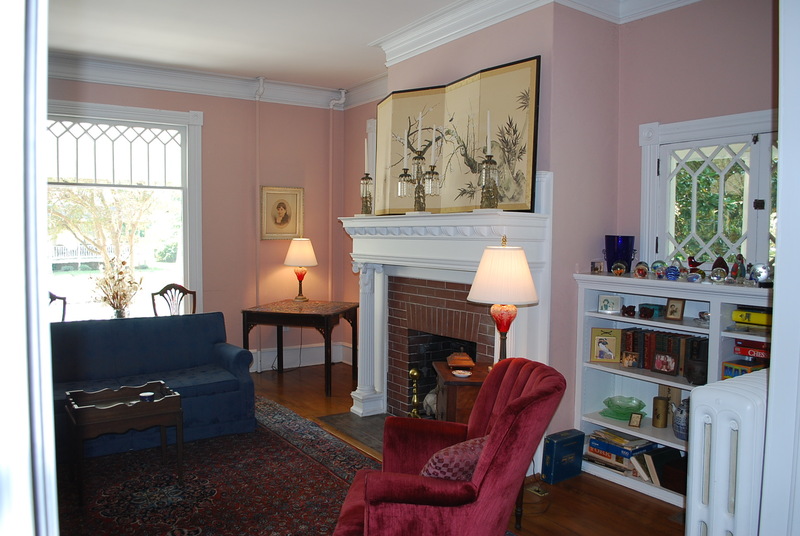 The original moldings, pocket doors and high ceilings help maintain the integrity, warmth and beauty of this stately historic home. 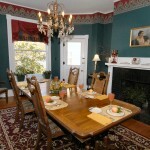 Outfitted with comfortable furniture and plenty of reading material and games, the common rooms include a large dining room with fireplace, a spacious living room with fireplace, a roomy parlor and, of course, the cheery kitchen with “never-ending” self -serve coffee and tea service plus guest ice maker . The gracious wrap-around porch is a favorite guest amenity and the perfect place to kick back on a balmy summer’s eve. 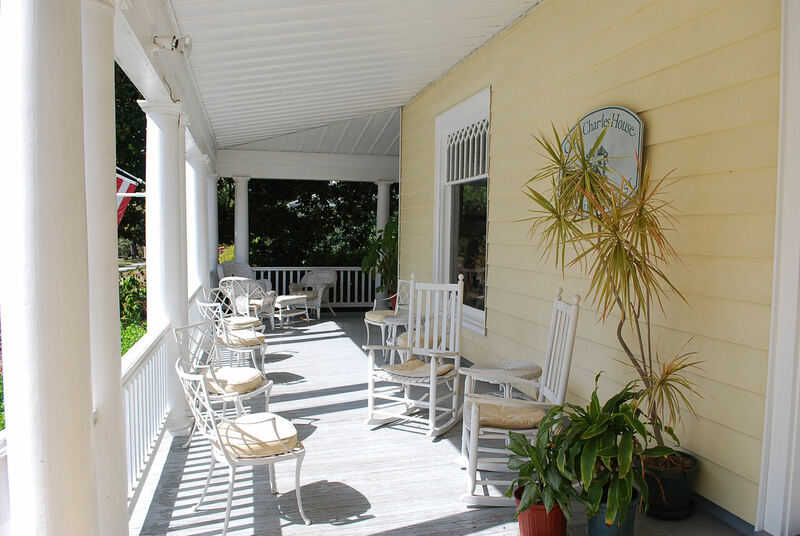 Filled with pots of blooming flowers and decorated with white wicker furniture, guests love to relax and unwind here, enjoying the refreshing breezes flowing off the Chesapeake Bay just a few blocks away. 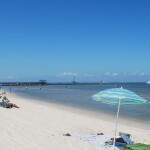 The town’s soft, sparkling sand beach and swimming area is not just a favorite of Southern Living magazine, it is one of the many prime recreational amenities that attract guests to Cape Charles House year after year. 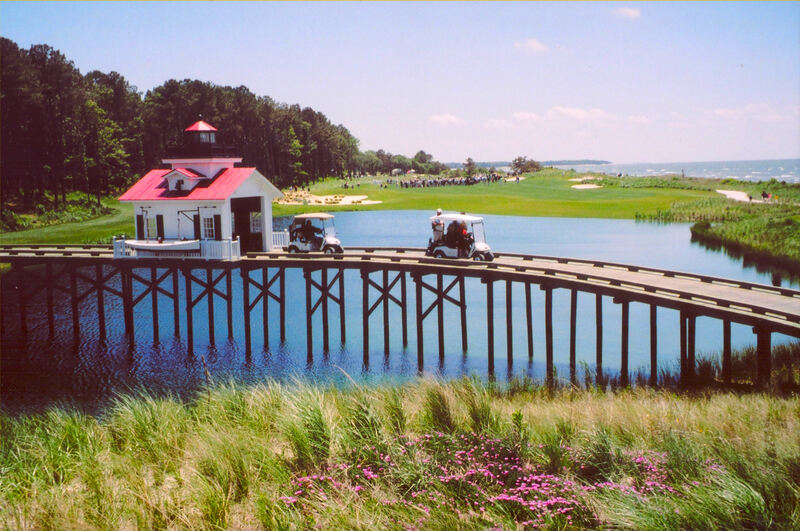 Golfers fall in love with the two side- by- side 18 hole award-winning Arnold Palmer Signature and the Jack Nicklaus Signature golf courses located less than 10 minutes away. 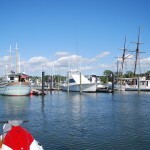 The deep water Cape Charles Harbor Marina and the King’s Creek Marina are both boater’s delights– in fact, lots of B&B guests arrive by boat and golf cart rentals are available for guests to tool around town during their stay. 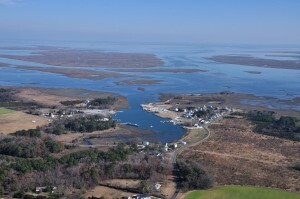 For Nature enthusiasts and bird watchers, the nearby Eastern Shore of Virginia Wildlife Refuge and the Hawk Observatory at Kiptopeake State Park offer a full range of unique outdoor activities. 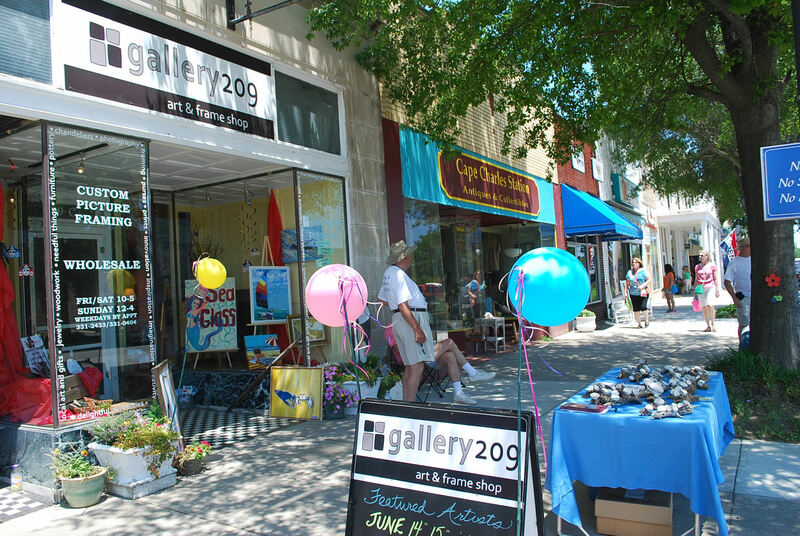 The Cape Charles Historic Area boasts vibrant little shops, art galleries, restaurants and the beloved Palace Theater, a lovely venue for live dramatic and musical performances. ( As a matter of fact, some impressive artists, including the Virginia Philharmonic Orchestra, have played at the beautifully restored Art Deco design Palace. Theatre. ) 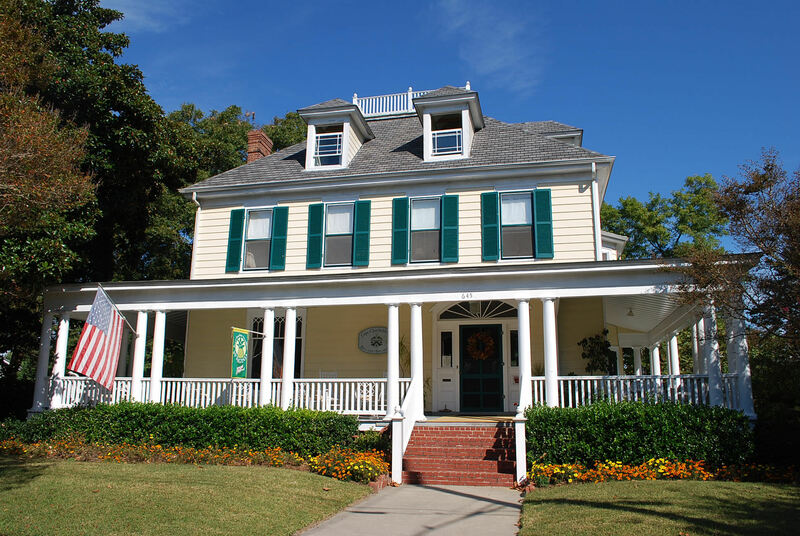 Fine and casual dining opportunities, both in-town and nearby, offer a variety of delicious cuisines including luscious local seafood, the famed steamed Chesapeake Bay blue crabs and authentic Southern-style BBQ. 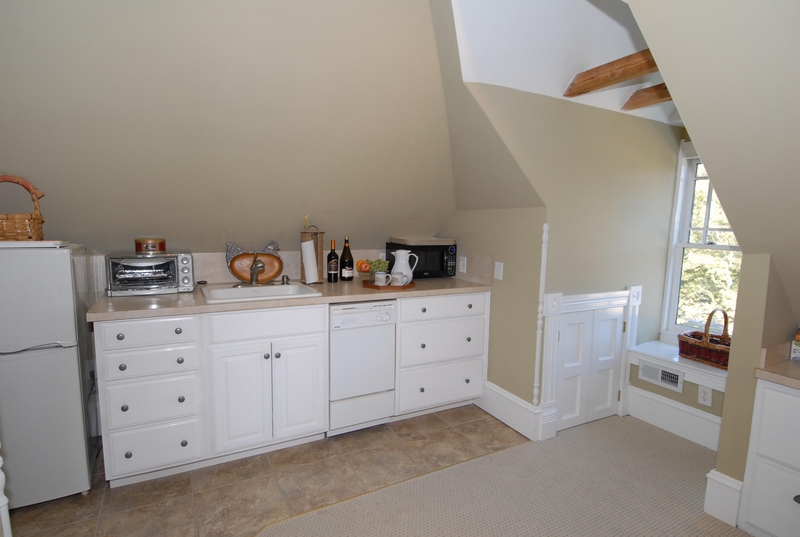 Prospective purchasers will really appreciate being able to retreat to the roomy owner’s quarters. 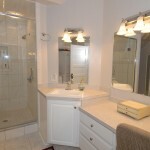 Offering total privacy from the rest of the house, the third floor has been remodeled into an owner’s penthouse apartment, complete with a master and a guest bedroom, an office area, a sitting room and a kitchen. 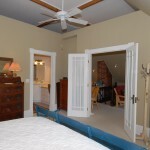 The owner’s quarters sunny master bedroom overlooks park-like grounds and includes a huge walk-in closet and a sumptious master bath. 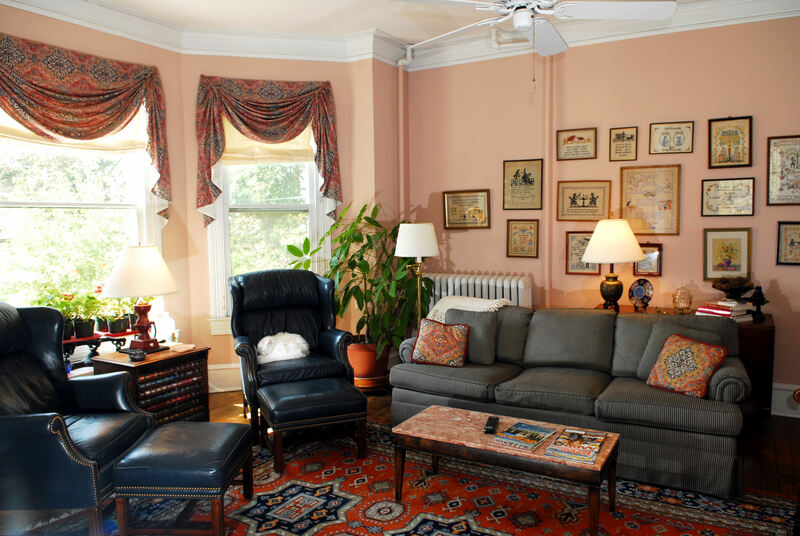 At the end of a busy day, the owner’s apartment provides the perfect place to relax and retire into your own private world. What a great house and terrific town for actually being able to live the dream of owing a spectacular historic home and being your own boss !! 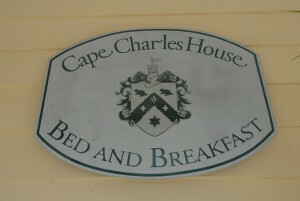 In addition to the real estate itself, the purchase price of $695,000 for Cape Charles House B & B includes most furnishings, as well as ownership of the trade name, website domain name, the telephone number, the B&B’s very attractive website and its valuable guest list. Financial information is available upon request by calling the Blue Heron Realty Co. listing agent team of Gerry Forbes and Heather Brady, who may be reached at 757-678-5200. 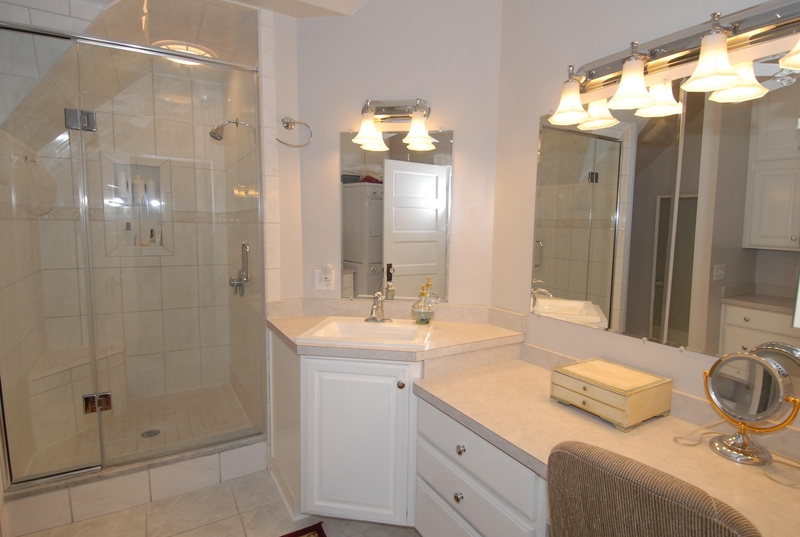 You are currently browsing the Life and Real Estate on the Eastern Shore of Virginia blog archives for November, 2013.